@Homes is so fortunate to have our client and friend, Amy Jackson, share her insight of living in the Huntsville area. She and her beautiful family relocated to the area from Florida. They are explorers and know the North Alabama area well. With the weather warming, it’s time to get out and enjoy the beauty that is offered in our home town. Thank you Amy for sharing your favorite trails and greenways! 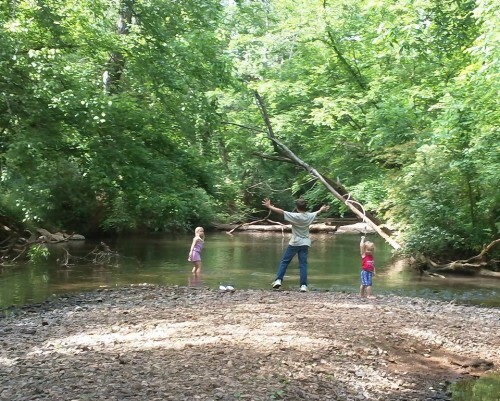 One thing you will never experience in the Tennessee Valley is a shortage of outdoor activities. If you are looking to get active in the great outdoors, Madison and Huntsville have some beautiful hiking trails and greenways for adventurers of all ages. In Madison, Rainbow Mountain preserve is a great place to give hiking a try. Off Stoneway Trail, Loop Trail is a one and a half mile rocky path that follows a cliff ridge on the east side of Rainbow Mountain. You can enjoy a view of Madison, check out some fossils, venture into caves, and see rock formations such as Balance Rock. Other smaller trails like Wild and JaMooko Loop can be found along the way. The Mill Creek Greenway is located off Mill Road in Madison and has a playground for the kids and a dog park for your beloved pet to run around. This greenway also makes a quite a showing of fall’s brilliant colored leaves. Also in Madison, the Bradford Creek Greenway off Palmer Road follows the beautiful creek through forests and wetland areas. There’s plenty of wildlife to be found so keep a keen eye out. On the border of Madison and Huntsville is the Indian Creek Greenway which can be accessed via Old Madison Pike Road or behind the Creekwood subdivision off Slaughter Road. This greenway has something for everyone. Creekwood Park has a playground that will entertain toddlers and elementary schooler’s alike. There’s a dog park for your pet and an 18 hole disc golf course. The greenway traverses Indian Creek with several spots to enjoy the sound of the running water, wade in, and skip some rocks. This is my family’s favorite place to ride our bikes and stop for a picnic lunch by the water. In Huntsville, Monte Sano State Park offers stunning mountain top views and 22 miles of hiking and biking trails suitable for all different difficulty levels. Near the entrance of the park is a large playground for little ones to get some energy out. Along the trails you can find rock formations and small waterfalls. On the North Plateau Loop Trail there is an overlook where my family likes to stop for a picnic. There are also other picnic areas and places to grill after you’ve worked up an appetite on the scenic trails. In southeast Huntsville on top of Green Mountain the Madison County Nature Trail is a gorgeous place to enjoy being outside. This 72 acre park has a one and a half mile walking trail along with picnic tables, a pavilion, an outdoor classroom, a beautiful covered bridge and even a chapel. The spectacular fall foliage is not to be missed here, but spring also boasts beautiful blooming dogwoods and azaleas. Whether you’re taking a jog or biking with your family down one of our greenways, or you’re getting back in touch with nature on one of our beautiful mountain trails, there is a path in our area for everyone to explore.